On its 93rd year, Mapúa University looks back at the achievements and accolades it reaped the past year—a proof that collective engagement will surely lead to reaching ever greater heights. Founded in 1925, Mapúa started as a night school offering Civil Engineering and Architecture courses. The school was envisioned to be a training ground for future engineers and architects as the founder, Don Tomas Mapúa, saw that the country’s manpower lacked the skills set and technical expertise to build a nation. At the end of World War II, these engineers and architects trained under Don Tomas took on the responsibility to rebuild the Philippines from the ravages of war. Today, as Mapúa celebrates its 93rd year as a well-renowned institution for engineering and technological education, the school is proudly counting the laurels and achievements it has received the past year. 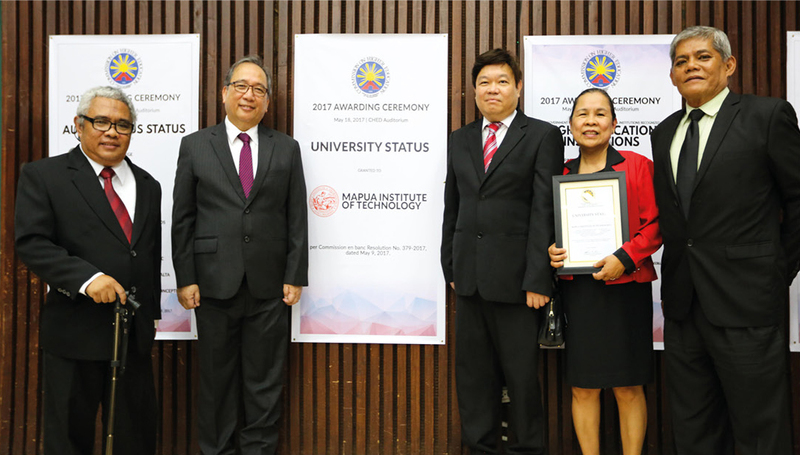 “It took years of careful planning, determined and patient execution, teamwork, and top-level support to arrive at the ‘banner year’,” said Mapúa president and chief executive officer Dr. Reynaldo B. Vea. These achievements are concrete testaments to the University’s commitment to quality assurance, high-caliber education, and research that offer well-suited solutions to problems of industries and communities globally. After more than nine decades and with the significant investments in quality enhancement after the takeover of the school by the Yuchengco Group of Companies (YGC) at the turn of the century, Mapúa continues to uphold the tradition of excellence it is known for, its clear manifestation is the number of professionals it has produced in the field of science, engineering, and technology. With all these, Mapúa is now one step to realizing its vision—to become among the best universities in the world—when it was elevated to a University last year. The grant presented another challenging yet fulfilling mission: to operate over and contribute to a wider intellectual front. On May 18, 2017, Dr. Vea along with other school officials formally received the University status granted by the Commission on Higher Education (CHED). (L-R) School of Graduate Studies Dean Dr. Jonathan W.L. Salvacion; Mapúa President and CEO Dr. Reynaldo B. Vea; Executive Vice President for Academic Affairs Dr. Bonifacio T. Doma, Jr.; former Registrar Lobella G. Damian; and Continuous Quality Improvement Office Director Cesar C. Coronado received the university status grant for Mapúa at the Commission on Higher Education on May 18, 2017. “We feel fulfilled and honored by this award. It behooves us to strive to reach even greater heights," he continued. It has always been Mapúa’s mission to be among the best universities in the world. In fulfilling this, the university has pioneered the adoption of the outcomes-based education system (OBE) in 2006 in order to fine-tune its programs and align them to international standards. OBE is a learner-centered approach requiring students to validate their knowledge through measurable outcomes. This benefitted the students as several engineering and computing programs became accredited by the US-based ABET two years later. It has also contributed to the generation of new knowledge with several research projects being done by Mapúan researchers here and abroad; and now with the elevated status, Mapúa has greater access to extramural funding for high-impact research, innovation, and development. One of the significant criteria for the university status grant is the number of research publications in reputable and internationally refereed journals, a requirement that Mapúa has met through several research papers. “What we have been able to show is our capability to do research,” said Dr.Vea. “We have many faculty members who are very active in research.” Following the grant, Mapúa has also been given recognition by the prestigious Quacquerelli Symonds (QS) of London—a testament to its commitment to delivering high-quality education at par with international standards. The QS Stars is a rating system that gives students and the international community a wider picture of a higher education institution’s strengths and qualities. A university is evaluated in a broad range of categories wherein it is awarded a rating from zero to five for each category, as well as an overall rating. Mapúa received a five-star rating in the categories of employability, facilities, and social responsibility, and four stars in inclusiveness in teaching. 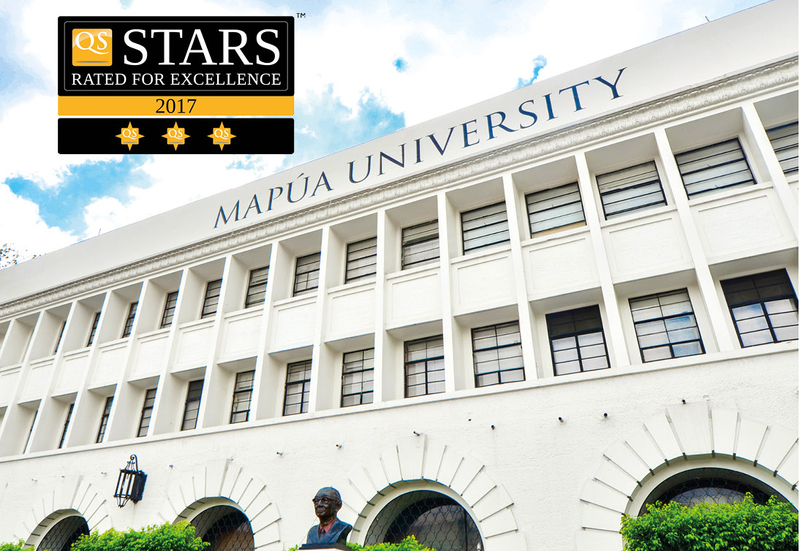 According to Mapúa University’s executive vice president for academic affairs Dr. Bonifacio T. Doma, Jr., the QS Stars rating shows the strengths of the University and what qualities need to be improved. “The rating clarifies to us what activities and improvements we need to implement in order to provide more quality education for our students,” Dr. Doma said. He added that the rating will boost Mapúa’s presence in the international scene and will serve as guidance on how the University can further bolster its efforts in internationalization. “As significant as our advancements have been in internationalization, there is still a need to increase our inbound and outbound students and faculty. The University should also forge linkages with more universities abroad for actual researches and projects,” he said. The QS evaluation said that there are already 17 active international collaborations that the University has. By adhering to the criteria set by QS for the star rating, the University already has a strategic plan for the further improvement of several aspects—research, internationalization, facilities, and others. These will then trickle down to the community and Mapúa’s stakeholders. “All these will redound to the continuous improvement of student services, quality of teaching, and learning facilities, thus further improving the delivery, as good as it already is, of quality education in Mapúa,” Dr. Doma added. Part of this improvement is having advanced technologies in place and using these to the full advantage of the Mapúan community. Late last year, Mapúa University has once again revolutionized engineering education by offering the first ever fully online engineering master’s degree program in the Philippines. Through its very own online education platform, the Mapúa Digital Academics, the University is now accepting the first batch of students who wish to take the Master of Engineering in Industrial Engineering (MEP-IE). Dr. Vea said that the program was chosen for its wide range of applications in the field. Because it is online, those who wish to undergo the program will have the convenience and flexibility to study at their own pace and time. 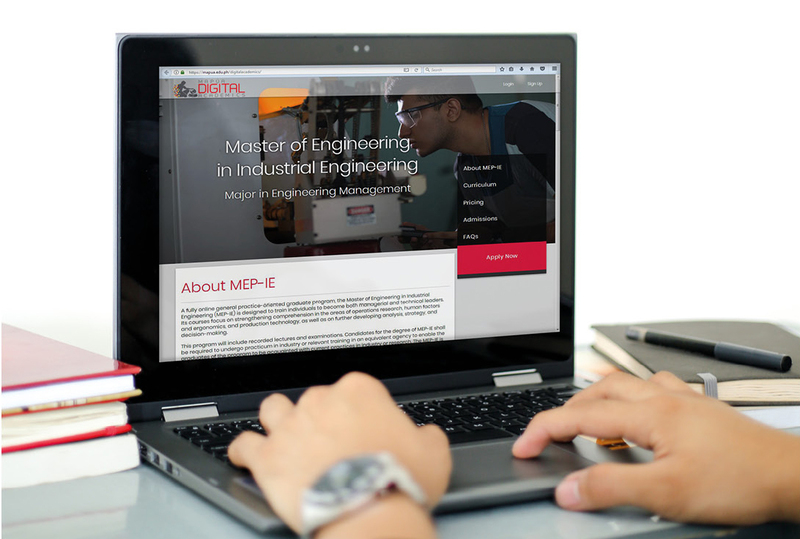 MEP-IE is open to current professionals anywhere in the world seeking to upgrade their knowledge and technical skills and is designed for graduates of engineering, technology, or business. Prior to this, Mapúa has started to opt for online classes to lessen the need for make-up classes during typhoons and other events that will hinder students and professors from coming to school. Dubbed as Digital Days, the university has proven its capacity to hold synchronous classes online in a given timeframe. “Our recent experiences in offering specific courses not only in the blended instruction mode but also in the massive, simultaneous real-time delivery of lectures have given us the confidence to offer an entire program study in a fully online mode,” said Dr. Vea. These experiences have also allowed the university to come up with Digital Rush, a series of fully online undergraduate courses to avoid traffic woes when going to and from school. As of date, four classes have been offered: Algebra, Linear Algebra, Differential Equation, and Probability and Statistics. These classes are offered in the morning and evening rush hours. “In general, aside from improving the teaching-learning process, we are changing the way we communicate with our students and the way the administration transacts with them so that we are attuned to the digital times,” Dr. Vea said. Both implementations—the MDA and Digital Rush—allow Mapúa to compare how effective online classes are versus the traditional face-to-face interaction between teachers and learners. The comparison will allow the University to refine and fine-tune both in order to serve its full benefit to the students. For the years to come, Mapúa continues its commitment to deliver the quality of education that it has been known for years. As it looks back on its laurels, the University patiently looks forward to more exciting years ahead. “We shall continue steadily moving towards the realization of our vision of being among the best universities in the world. We will continue slogging through our institutional development plan in order to reach more exciting milestones,” said Dr. Vea. He says that these achievements would not have been possible if not for the constituents who embody both the tradition of and passion for excellence in teaching. “Most, if not all, faculty members teach because they have a passion for it. To keep this fire going, there has to be support for faculty in terms of their being current in content and methodology and technology,” he said. He added that support comes in the form of scholarships, advanced technologies, and centralized offices for the advancement of outcomes-based and digital education.